Add drops of oil to the lava rocks, and the subtle, soothing scent brings you back to that magical spot. 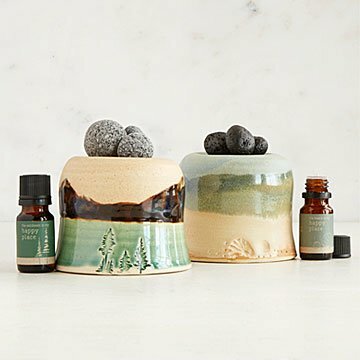 Take a trip to your happy place any time you like with this handcrafted diffuser inspired by the beauty of nature. Julia Dean creates ceramic bases with two different scenes, and each pairs with your choice of matching essential oils: Outdoors or Beach. Just add drops of oil to the lava rocks, and the subtle, soothing scent will bring you back to that magical spot. Lava rocks sourced from Indonesia. Diffusers made in New York. Julia Dean comes from a long line of craftsmen: Five generations of her family have worked with stone, making monuments in Kentucky. So shaping natural materials by hand has been a tradition in her family since 1881. Julia's work with clay helps carry that legacy forward. She first fell in love with clay at age 10 while watching a potter work, but it wasn't until college that she learned to throw pots on the wheel. With inspiring educational jaunts to places like Penland School of Craft and Chautauqua Institution, she has been designing and creating pots and teaching others pottery since 1998. One essential oil bottle should last approximately one month with daily use. I loved the idea of not needing electricity or batteries for the oil infuser in my bathroom. It's nice walking into a bathroom that has a nice light scent. Maybe I will need to try a different essential oil. It's better than nothing, but not quite happy yet. The girls were very excited with the great fragrance, and I couldn't believe it worked without electricity as a diffuser would. Beautiful nature design goes well with my decor, but it didn't come with any directions so I'm not sure how it works. The base of the diffuser lacks a soft material like felt or cork to protect the surfaces of my furniture or shelves. Over priced. My only question is, where can I get scent refills? This product was a bit smaller than I expected, however that was on me for not reading the dimensions properly. Other than that , it's a super simple set up with beautiful clay design and a note about the maker. Just what I was looking for! This makes a nice gift for a beach person that cannot make it to the beach.